Hello Wesley, thanks for the positive feedback! We're always happy to hear good things from our customers. Staff are amazing and very helpful. Couldn't find a better service with value for money storage. Been with storage king 4 and a half years and couldn't be happier. Hello Tracy, thanks for the positive feedback! We're always happy to hear good things from our customers. Have had a storage shed here for over 3 years now for business and the service given by Mark and Glen has been outstanding -that is why we continue to have a storage unit here. The guys go out of their way in helping us with deliveries and items to be picked up by couriers and always notify us of items delivered - much appreciated! Thanks for the great review, devinda01. It was a pleasure serving you as a customer. I was recently talking to a client of mine and they informed me that when they had their items in storage at this facility there was someone living in one of the sheds. Very unprofessional. I would recommend going to storage king at a different facility. They where confronted by the man on one occasion and was not a pleasant experience. I am sharing this on behalf of my client who wishes to remain anonymous but has a photo to prove it. Reserved a unit over the phone yesterday and was told I needed to allow 15-20 minutes to do the paperwork this morning before work. Arrived at 8.25 and told the very arrogant man on reception I had to leave at 9. He told me I would have to come back later when I had more time cos it would take longer. He rudely told me that I should have done it yesterday. Do not use this place he is very rude and there is no customer service. Big loss for them I work in real estate and am always asked for storage recommendations!! Have now gone somewhere else - paid more but awesome service!! ABSOLUTELY DISGRACEFUL!! I was one day late with a monthly payment on a shed I had been renting for over a year they cut off my padlock and removed my property and destroyed it.. I had a filing cabinet full of irreplaceable photos, letters from family that are no longer here and alot of other items I can never replace.. They said I removed some of my other items a week before and it was the only item left thought it was abandoned.. After one day of late payment broke into my unit and made that decision with out even as much as a phone call.. These people are absolute scum DO NOT TRUST YOUR STUFF HERE IT IS NOT SAFE!!!!! Excellent service and very friendly staff. Quick and easy to store anything for as long as you need. Fabulous service and facility. Nothing was ever any trouble - we extended our lease at short notice and were able to pay upfront to save some $$$. Staff were always extremely helpful and friendly. Highly recommended. Greatcustomer service, friendly and clean spaces. Excellent customer service, staff is always very friendly and helpful. Storage facilities always kept clean. Thankyou beenleigh storage King for your amazing service over the last 6 months.. Staff are very pleasant to deal with nothing was ever an issue alway happy to help whenever i needed anything... Anyone looking for a place to store their goods Beenleigh Storage is the place.. very reasonably priced always clean and tidy... keep up the great work!!! Beenleigh Storage King Staff are the most helpful and caring people who are always happy to help in any way they can. Thank you Glen, Scott, Greg and Brett for all of your help. Their services and great customer service really can't be matched anywhere else. Thank you again for everything. Storage King Beenleigh generously supported the non-for-profit charity, On The Edge (61 George St Beenleigh), for 14 months with free storage. Through their support, it made it easier for us to help families in need with furniture, clothing and supplies. Also, the money saved in storage fees helped contribute towards providing hot meals and showers for the homeless and food parcels for families in need in the Beenleigh community. Their facilities are immaculate, access is easy, their service and staff are friendly and helpful. We thank storage king for all their friendliness and excellent service.It surely made such a big difference and definitely it was much easier with our move. Their prices are unbeatable and we will surely recommend them to anyone. We were also very impressed with the free use of their trailers and the spotless condition of their facilities. Great helpful staff, clean and secure facilities, safe environment, range of storage shed sizes, variety of packing materials for purchase, trailer available for clients, bathroom onsite during office hours. Highly recommend Storage King Beenleigh for storage solutions. Written by a long term client. Thank you to the wonderful staff at Storage King at Beenleigh for making my move to Queensland just that much easier. Every time I called Scott, nothing was a problem and everything was solvable. On arrival, they even sized up my storage unit and worked with my removalists (CityMove...also awesome staff and service) to ensure everything was unloaded and stored safely. So grateful that a friend recommended these guys. Awesome staff and service. Thank you again!!! Highly recommend, fairly priced, access early and until late is great thanks guys, if I have to use again which hopefully I won't but if I had too I will be coming back.. Storage King Beenleigh are the BEST. Affordable, very helpful friendly and efficient staff, easiest access! A fantastic range of packing products, anything you need! Our family now has Two units now. I was having nightmares about packing all our stuff last month BUT complimentary trailers, trolleys, lifts made the job so easy !!!! Thanks Storage King!!!!!! Friendly, helpful staff! Convenient and loved being able to use the courtesy trailer. Recommend these guys for your storage! Thanks! 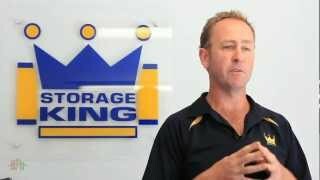 We previously used Storage King Beenleigh in 2010 when we had our belongings in storage whilst building a new home. We did not hesitate to use them again this month as we are again "between houses". We have found their storage facility to be excellent, very clean & secure. The staff are friendly & obliging of our needs - we would highly recommend them if you are in need of a storage facility. I was quite impressed with Storage King Beenleigh. Looked at a few other places and Storage King was in a league of its own, Top service from all the staff and the prices were the best for the top quality they provide. Highly recommended Storage Facility! Seriously amazing storeage facility. As a store manager myself, it is always refreshing to come across another company with such amazing customer service. The guys here are such a fantatsic bunch. The staff went above and beyond to help us out when we first moved our stuff into the storeage facility. Even though we were moving on christmas day. They have been nothing but helpful ever since.... if anyone is looking at a storeage faciltiy. GO NO FURTHER THEN STOREAGE KING BEENLEIGH!!!! The Storage King Beenleigh storage facility has been excellent. My wife and I moved into a small apartment when we came to Beenleigh and we needed somewhere for our surplus stuff. The staff have been unfailingly helpful and friendly and the storage unit has kept our things clean, dry and pest free for a very reasonable cost. Many thanks. I HAVE USED 3 STORAGE FACILITIES OVER THE LAST 12 MONTHS, EACH FOR EXTENDED PERIODS. STORAGE KING BEENLEIGH IS A STANDOUT FOR MANY REASONS - GREAT RATES, 7 DAY ACCESS, SPOTLESS AND SECURE UNITS. THE STAFF ARE EXTREMELY COURTEOUS AND HELPFUL - NOTHING IS A TROUBLE TO THEM. I WOULD NOT HESITATE TO USE THESE FACILITIES AGAIN AND I WHOLE-HEARTEDLY RECOMMEND YOU GIVE THEM A TRY. Storage King Beenleigh is a great facility and spotlessly clean - their location is easy to find and all the units have drive-in access. They have all the cartons and tape you will need to make moving and storing your treasures as easy as... The helpful email/account reminders stop you falling behind with payments. They have all different sized units which means you don't have to pay for space you don't need.. Oh - and did I mention the staff - they are all so helpful and friendly. So, to Scott and his team - many thanks for making a difficult job so-o-o easy. I have nothing but great things to say about the experience Ive had with Storage King Beenleigh for the past 9 months. Their facilities are of a high standard and I had total peace of mind knowing my belongings were in such a clean and secure environment. By far the most outstanding aspect of the company is the customer service of the team there. Greg and the team are the most friendly, helpful and flexible people who always go above and beyond to assist in any way they can. Nothing is ever too much trouble. Great product, Great Service. Would definitely recommend and use again! Very friendly accommodating staff. I find the place very clean and secured and their prices very reasonable. Storage King Beenleigh proudly services Mount Warren Park, Eagleby, Edens Landing, Holmview, Windaroo, Bahrs Scrub, Stapylton, Yatala, Bannockburn, Waterford and Logan.